Moons, flowers, and birds are among the subjects Ann Craven has returned to for over two decades. Craven began painting birds in 1997, and since 2002 has created at least one bird painting every year. 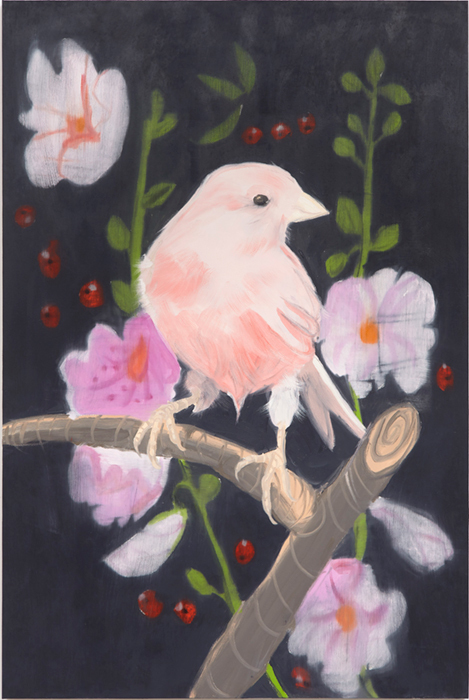 Her source is a single, out-of-print ornithological book, and she often returns to the same image, painting multiple versions of the same bird, varying the color or background multiple times. Repeating and returning to an image, as an artistic practice, hold particular meaning for Craven as a way to question authenticity and also to acknowledge the passage of time and each work’s connection to its predecessor. And though she returns to the same source image, for Craven each painting is a unique stand-in for a person or scenario, a reflection of her memories or current inner life. Craven had her first retrospective, TIME, curated by Yann Chevalier at Le Confort Moderne in Poitiers, France in 2014. Craven’s paintings are in the public collections of MoMA, New York; the Whitney Museum, New York; The New Museum, New York; and the MCA, Chicago, among others.